The Motor Vehicle Commission of New Jersey handles vehicle registration and renewals. If you’re a new resident, you must register your vehicle as soon as possible. For those who have purchased a new vehicle, you may require temporary plates to drive legally until your registration is processed. There are various types of license plates available in New Jersey. For example, personalized license plates allow you to create your own plate number. If you have purchased a new vehicle or became a resident of New Jersey, you are required to go to a Motor Vehicle Commission (MVC) for license plates. 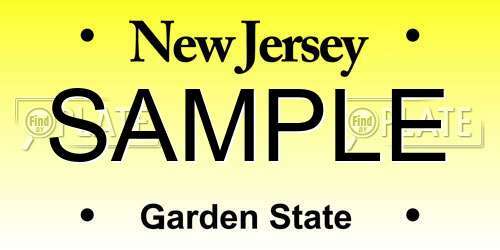 The standard license plate provided by the state of New Jersey has a yellow background with black lettering. If you have a disability, you can apply for disability plates or placards as long as you meet eligibility criteria. Also, there are various decorative license plates available for an additional fee. You can personalize any license by selecting your own plate number. You must following the MVC’s guidelines to be granted permission to produce these plates. If you purchase a vehicle from a dealership, the dealer may process your vehicle’s registration. They may be able to issue you temporary plates until your registration is completed. Alternatively, you can go to your county’s MVC office to pick up temporary plates if you’re purchasing a vehicle from a private seller. Temporary license plates allow you to drive legally and remain valid for 10 days after purchasing from a licensed provider. For those with a disability, you may be eligible for disability license plates or placards. These plates are issued only to those with a medical disability. If you receive a disability placard, you are required to display it from your rear view mirror and it must be visible at all times. Having a disability plates or placards permits vehicles to park in designated parking spaces through the state. When you apply for specialty license plates, you’ll be required to pay fees in addition to the standard registration fee. Contact the MVC for complete details. Personalized license plates allow you to design a custom plate number for your vehicle. You can look up available license plate numbers in New Jersey online. You can transfer your license plates if you purchase a new vehicle in New Jersey. The cost of transferring license plates is $4.50 in addition to any registration fees for the new vehicle. You are not permitted to transfer your license plates to another person. You can surrender your license plates either in person or by mailing them to an MVC office in your county. Before your license plates expire, you must renew your registration with the MVC. You can renew your vehicle either in person, by mail, or online. When you receive your new decal stickers, you can place them directly over the old ones. Remember, if you obtain specialty or personalized plates, you may have to pay additional fee at registration and renewal. Wondering if the plate number you want is available in New Jersey? Use FindByPlate to look up license plates in New Jersey, California, or any state throughout the U.S.
All you need is the license plate number and the state to find any information for a license plate registered to a vehicle or find an available plate number to personalize your vehicle.